On location executive portraits are just one of the areas that I focus on in the commercial and business photography segment of my business. 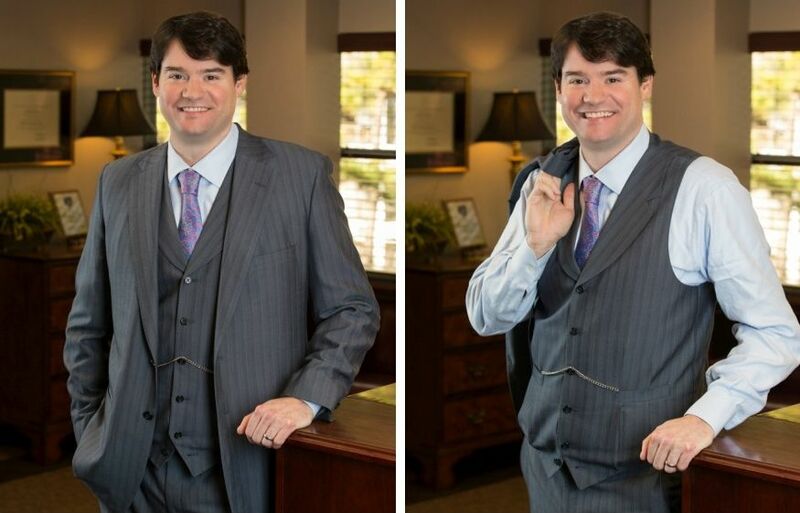 The image above was taken in a North Raleigh Law Office of a well known Raleigh Attorney that advertises on TV very often in the Raleigh market. I managed to get numerous usable shots of him in 3 different outfits in about 45 minutes. However, I did have help: Two Assistants and A Makeup/Clothing Professional along with the head of marketing for the law firm. But in my world of commercial photography, all of that is not uncommon. This post is not really about executive portraits though. It's really about "What Are You Passionate About?" as a photographer. Why are you focusing on the segment(s) of the industry that you a pursuing? Are you truly focused on the right market segment? Photographers should pursue the core area(s) they are truly passionate about and not go after a market segment because of the potential financial benefit. For example, a friend of mine is passionate about wedding photography, but I a have ZERO desire to shoot weddings. I am passionate about commercial and business photography. Why? There are several reasons that I am passionate about commercial and business photography. 1) I love working with busy professionals (some well known) and getting results for them quickly. 2) I love the varying dynamics of a commercial assignment compared to a consumer photoshoot. 3) I love how the images will be used which is often in publications, other print media, advertising, on a company website, etc. 4) I love the fast paced environment of corporate events and literally having seconds to get the shot. 5) I love negotiating contracts and closing new business. That's a non-photography motivator. 6) I love the travel involved. It's nice to get out of the studio and it's nice to travel the US. But not all the time. 7) I love working with marketing professionals, creative directors, agencies, etc. that are often involved in commercial assignments. 8) I love doing individual headshots because I a passionate about capturing the personality of one single person. This list is NOT all inclusive but are things that literally came to me as I started typing. If you are a photographer and cannot list numerous reasons why are you focused on the area(s) of photography that you are focused on and do it without hardly thinking about it, you may want to reconsider your area of focus. Notice that the closest thing to money in my 8 quick points above is #5 not all 8. If you enjoyed this post, please don't hesitate to share it with the world using the social icons below.